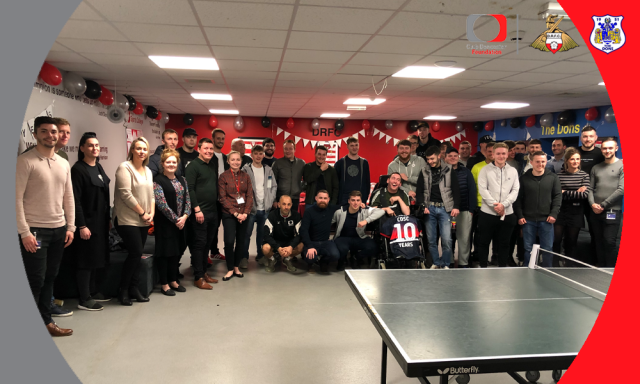 Club Doncaster Sports College kicked off their ten-year anniversary with a high school-style reunion at the Keepmoat Stadium before Doncaster Rovers faced Bristol Rovers on Tuesday night. Former students were invited back to the College to reminisce about their experiences from years gone by, before staying to witness Doncaster Rovers convincingly defeat Bristol Rovers to move back into the play-off places. The occasion proved to be a great opportunity for former students to catch up with old friends and staff whilst watching the football unfold. For plenty of those in attendance, the College was unrecognisable, having grown in both size and reputation over the past decade, something which has delighted business development manager, Jenna Scully. She said: “It’s crazy to look back and see how far the College has come in ten years. The College has changed the lives on many young people have walked through the College doors, which Jenna hopes can continue to be repeated in years to come. She said: “It was great to see so many students come back last night and have a good time. Former student Glenn, who enrolled at the College in 2008 after losing his job, stated how the College helped him gain employment in an industry he loves being in. The celebrations do not just stop here, with plenty more events scheduled throughout the calendar year in recognition of the College’s achievements over the past ten years, most notably a legends game between former students. The College offers Level 2 and Level 3 sport programmes for 16-19-year-olds, as well as a degree programme, which will see its first ever graduates in 2019. Football and Rugby Academies run alongside all courses and see teams compete in both the EFL’s Community and Education Football Alliance Leagues, and the Association of Colleges League. For more information on the ten-year anniversary and Club Doncaster Sports College, please visitwww.clubdoncastersportscollege.co.uk or call 01302 764663.